A great shoe brand or retailer needs to have the confidence in any partner that provides unique technology. We understand this and take our R&D very seriously. We follow a rigorous internal process from conception to commercialization to guarantee our customers proven, fully tested and commercialized products. We make it easy to test and implement Insolia Products. And, if needed, we provide free on-site support to you. We start with the identification of a problem. This can come from our own knowledge or from something you bring to us. To truly understand a problem we must first understand the cause of the problem. Only then can we find the real solution to the problem. Then we must engineer and commercialize the solution to fit into standard shoe manufacturing process without effecting styling or designs of shoes. Understanding the customer’s problem and engineering a solution that works in production — that's the Insolia Development Process. 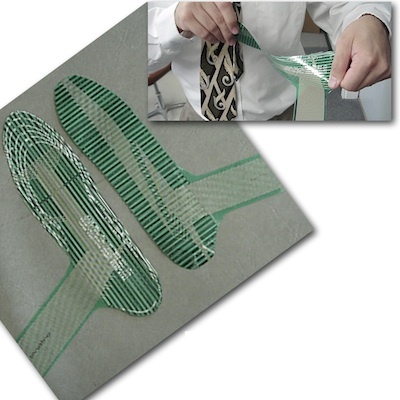 TekScan's F-Scan Thin Film Sensors used to capture in-shoe pressure data while standing and walking. In the late 1980s a female patient challenged Dr. Dananberg to make women's high-heeled shoes comfortable. Intrigued by this challenge, he began to study shoe making and learned that the basic design of a high-heeled shoe has not changed in hundreds of years. At the same time he was receiving recognition for his work with in-shoe pressure analysis, a technology that gave him the ability to look inside the shoe and see how high heel shoes actually work during walking. Dr. Dananberg learned that the design of high-heeled footwear shifted the wearer's weight and center ofbalance forward, and this was the root cause of the problems with high heels. Once he understood this, he was determined to find a solution to the problem. Dr. Dananberg went to the streets of New York City and asked women about their love of high heels. "I had to understand why women put themselves through the pain. What I learned was that women loved their high heels and would never stop wearing them. It became obvious that I could not change high heel styling to solve the problem. Any solution would have to be done on the inside of the shoe without any change to the outside or standard shoe construction." After 400 years of living with the problem, it wasn't easy to find the solution. But with a combination of medical skill and modern thin film pressure sensing technology, he did just that. "Through months of trial and error and much in-shoe pressure testing, I was able to develop a conceptual handmade prototype. In June 2004 I presented my first design of a high heel insert to the company, and the Chairman, Brian Hughes, an MIT trained engineer, offered to develop a quick prototype based on my hand carved model. Two weeks later we gathered in my laboratory to see the outcome of Brian's work and conduct in-shoe pressure testing of the resin cast prototype. The results were extraordinary." A) First Hand Carved prototype, B) Cast Resin Prototype was the part tested in the story above. C) First Consumer Product was too wide to be built into shoes, but was just right for the Consumer After Market. The First OEM Product got it right and was the production geometry for many years. We launched a new version in 2016, the Improved OEM Product, which has been adjusted for better fit and function in current narrow shoe styles. The pressure contour map shows what we discovered when we looked at 75 mm heels, before and after we added Insolia Heels to the shoes. In the first image you can see that about 75% of this woman's weight is on the balls of her feet. This is why high heels cause so much discomfort and throw women's bodies and feet out of alignment. In the second image you can see what excited us so much the first time we saw it. Insolia Heels caused a third of the weight that was on her forefoot to be shifted back onto her heel! We had restored proper weight distribution in 75mm heels. The Wales Centre for Podiatric Studies and the Centre for Biomedical Sciences, both at the University of Wales Institute in Cardiff in the U.K. undertook a study on the "Influence of High Heeled Footwear and Pre-fabricated Foot Orthoses on Energy Efficiency in Ambulation". We learned a tremendous amount from this independent study, and we have since made this kind of analysis part of our R&D methodology. What they did was put "Ten healthy females (mean age 26.3 years, range 21 – 34) who were regular high heel wearers" on to a treadmill for 10 minutes and had them walk at 4.2 km / hour. While the women were walking, their breathing gases were tracked, as were their heart rates and the number of steps taken. Once they had finished walking the 10 minutes they were asked to rate various aspects of comfort of the shoes by pointing to a 15 cm scale marked from 0 to 15 where 0 was "not comfortable at all", and 15 was "the most comfortable condition imaginable". This data was then analyzed and the results are shown in the summary charts we have prepared below. Click on any of the images below to enlarge it. You can move from slide to slide with the arrow keys, or by swiping on your tablet. Hit ESC or the "X" in the upper right to return to this page. We have often heard criticism that the extraordinary results we report must be due to the placebo effect. 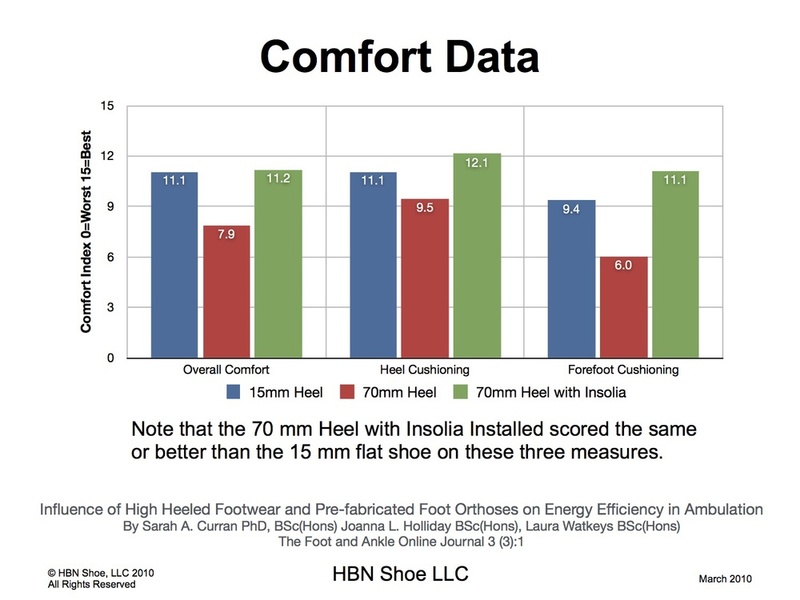 While that may be a factor in the subjective comfort scale, it can not be the reason for the dramatic reduction in oxygen when Insolia Heels were added to the test shoes. This is also true with the reduction in heart rate, and in the number of steps taken. Insolia Heels made a significant difference in how these women walked, and as a result they felt dramatic increases in perceived comfort. Anecdotally we could see that Insolia Heels appeared to improve a woman's posture in high heels. 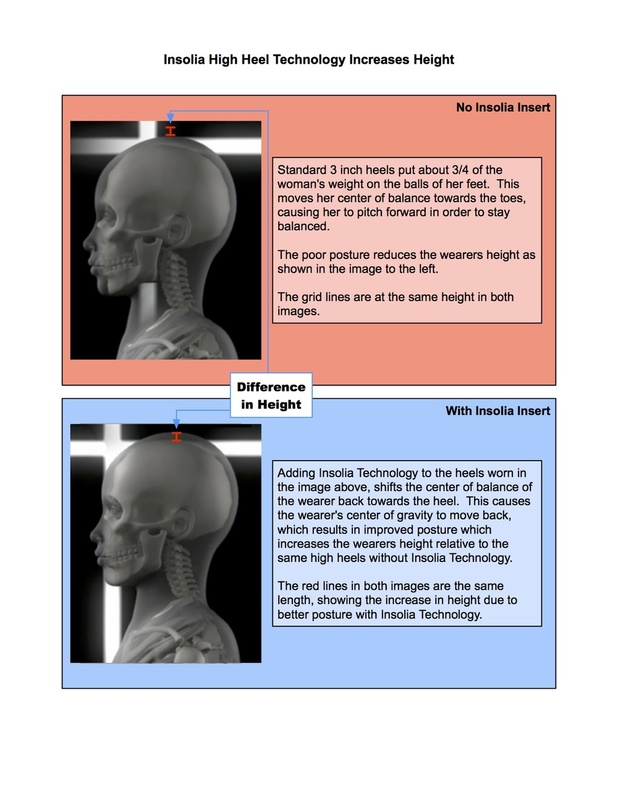 However, a customer asked if we could prove that Insolia Heels improved posture. We'd seen a piece on the Dr. Oz TV show that used 3D motion capture to illustrate how badly a woman's gait was effected by high heeled shoes. We decided to try the same approach. We went to Motion Capture NYC and they fitted our model in a LED encrusted body suit and fitted her heels with LEDs. She then walked back and forth and multiple sensors and cameras captured her every move. We then added Insolia Heels to the same pair of shoes and she repeated the process. Then the computers went to work, and this video is the result. You can click on the five thumbnails below to learn more about what we discovered as we dived into the data the MoCap process generated. As you'll see, we were able to document much more than a modest improvement in posture. The subtle differences in knee flex were only visible in a frame by frame analysis. The difference in how the foot landed, while obvious in retrospect, was noticed reviewing the first computer images. The increase in height, again obvious in retrospect, was dramatically called out when we compared frames. We were very pleased to be able to see the physical changes that produced the results in Cardiff Wales study. We could see the increased stride length that resulted in a reduced number of steps. We could also see how the awkward gait and increased back strain in the test subject in standard heels would result in an elevated heart rate and increased oxygen demand. It is no surprise that removing these problems resulted in significantly increased comfort scores. Click on any of the images below to enlarge it. You can move from slide to slide with the arrow keys, or by swiping on your tablet. Hit ESC or the "X" in the upper right to return to this page.